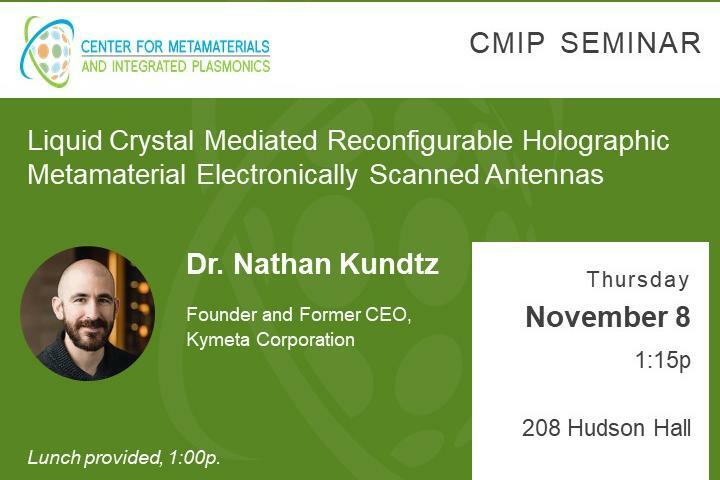 Dr. Kundtz will present on the technology behind Kymeta's disruptive products - Liquid Crystal Mediated Reconfigurable Holographic Metamaterial Electronically Scanned Antennas - and how they have been adopted globally. The underlying technology includes many cutting edge areas of research and development including Metamaterial design, RF Liquid Crystal devices, TFT-based devices for non-display applications, and Non-geosynchronous satellite communications. Dr Kundtz will discuss each of these areas of development and how they have been spearheaded by work at Kymeta while also sharing the path he took to reach commercialization and global adoption of a disruptive technology.